Every civilization throughout history has produced its own culturally unique group of masters who, with powers gained through physical, mental and spiritual discipline are able to perform amazing demonstrations of mind over body. Dai Andrews has travel the world learning these mind over body demonstrations from masters in every corner of the globe. From the Iron Body techniques of China’s great Kung Fu masters to the secrets of India’s mysterious fakirs, Dai will amaze and delight audiences of all ages with this unusual performance. “Qigong” or “Chi Gung” is a spiritual, slightly mystical branch of Chinese medicine and martial arts, the roots of which go back thousands of years. The name means literally means energy cultivation. Physical and mental health are improved by learning how to cultivate and manipulate Qi (Chi) or vital energy, through controlled breathing, movement, and acts of will. Qigong is generally divided into two categories, hard and soft. Soft Qigong focuses on developing and preserving this vital force in order to ensure the good health and longevity of the practitioner. 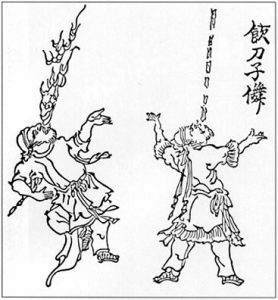 Hard or Martial Qigong on the other hand is only taught to disciples and advanced students of Kung Fu. It concentrates on learning to focus the Chi to specific points in the body in order to strike with devastating power as with Iron Palm or to toughen the body and protect it from harm as with Iron Body. Audiences will be thrilled as Dai Andrews demonstrates Chinese Qigong and Iron Body techniques put to the ultimate test. 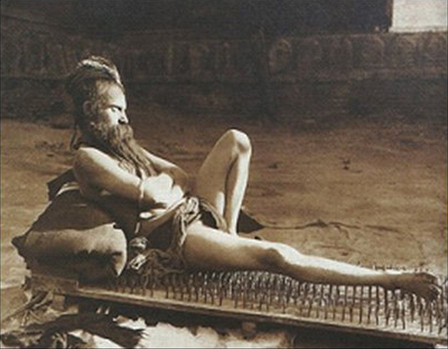 This unique performance showcases amazing feats of physical endurance as he demonstrates his Iron Body Qigong by breaking arrows and bending iron bars and spears with his throat, having concrete blocks smashed on his body while lying on a bed of sharp machetes and painlessly places his hand into real animal traps. 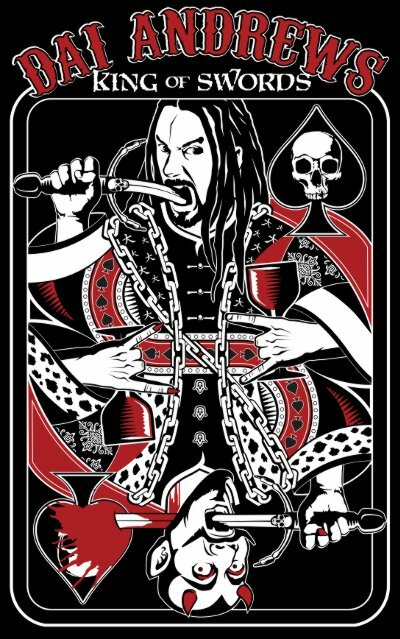 Finally in the ultimate test of fortitude, Dai wraps twenty feet of rope around his neck and then lets up to six audience members pull and tug on the rope as hard as they can! The audience members engage in a tug of war with the neck of Dai Andrews in the center, his throat taking many times the amount of pressure it would endure in an ordinary execution style hanging. You will marvel however when, ultimately Dai Andrews emerges from this brutal punishment totally unharmed! Currently Dai Andrews is the only person in the world to perform this dangerous feat, know as”The Man Who Cannot be Hanged”. Andrews performs “The Man Who Cannot be Hanged” for eager university students. Known as Tameshiwari in Japan, or Iron Palm Qigong in China, this ancient martial skill involves conditioning the hands to deliver devastating blows. Without the ability to deliver strikes with tremendous force, no martial arts journey is complete. In order to authentically practice combative martial arts, one must develop the hands to withstand heavy impact as well as learn to hit with savage power. A broken hand is not a part of fighting. 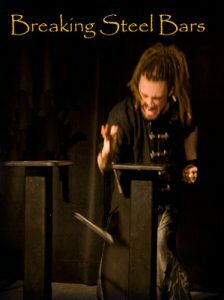 Dai Andrews demonstrates this unusual skill in his performance by breaking bricks, solid steel bars and burning stacks of boards with his bare hands. India’s Fakirs or Sadhus are religious aesthetics who practice yoga and meditation. They also perform austerities in order to demonstrate that the mind or spirit is stronger then the flesh of the body. These austerities can be simple demonstrations of faith like vowing never to cut their hair and instead wearing it in long dreadlocks known as Jatta. At other times these austerities can be extreme like subjecting the body to fire, or vowing to keep an arm raised above the head at all times for twelve full years before finally bring it down. A performance by Dai Andrews may include any of these. 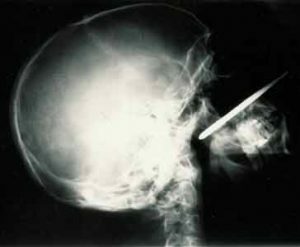 X-ray of Dai Andrews with a ten penny nail in his nose, “the Human Blockhead”.